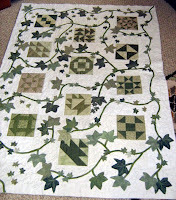 Yes, my "Ivy for Faithfulness" quilt, 48" x 52", is quilted and ready for binding -- and will be finished in good time for it's part in the Joy of Applique exhibit at Quilt Canada at month-end. After that show, I'm putting it into the General Display at Heritage Park's Quilt Festival at the end of May. And after that....well, it would appear a certain feline family member has his eye on it! Your cat is adorable....even on your beautiful quilt!